Bill Grumbine is a professional turner, teacher and furniture maker in Kutztown PA. 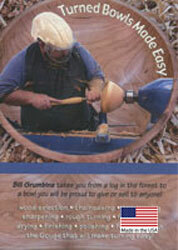 This DVD shows you every step from chainsawing the log to final polishing of the bowl. Great for beginners. The topics covered include wood selection, bandsawing, rough turning, final turning, drying and finishing. Tool sharpening is discussed along with his four basic bowl gouge cuts that make bowl turning easy. DVD's can be returned only for replacement if defective. Please call before returning DVD's.No returns will be accepted after 90 days.